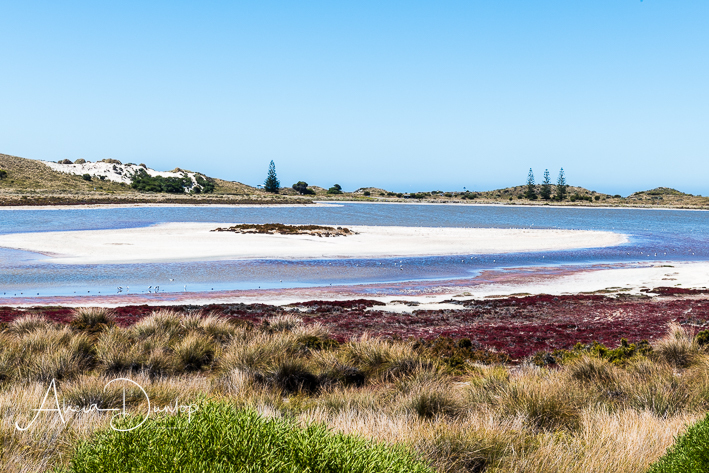 Rottnest Island in Western Australia is such a beautiful island. On the coast, the beaches are framed by sand dunes which are full of long grasses. Typically, for Western Australia, Rottnest Island has glorious white sandy beaches that are lapped by clear, azure waters. 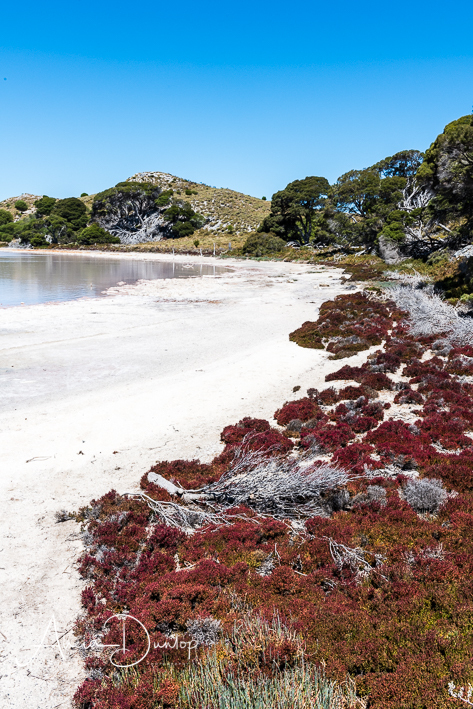 Rottnest Island boasts a group of salt lakes that are teaming with wildlife – in particular wadding birds. The edges of of the salt lakes are tinged pink due to algae. Like the coastal water, the lake water is a beautiful blue as it reflects the sky above. The vegetation that surrounds some of the lakes is Samphire. The result is a kaleidoscope of colours across the landscape. 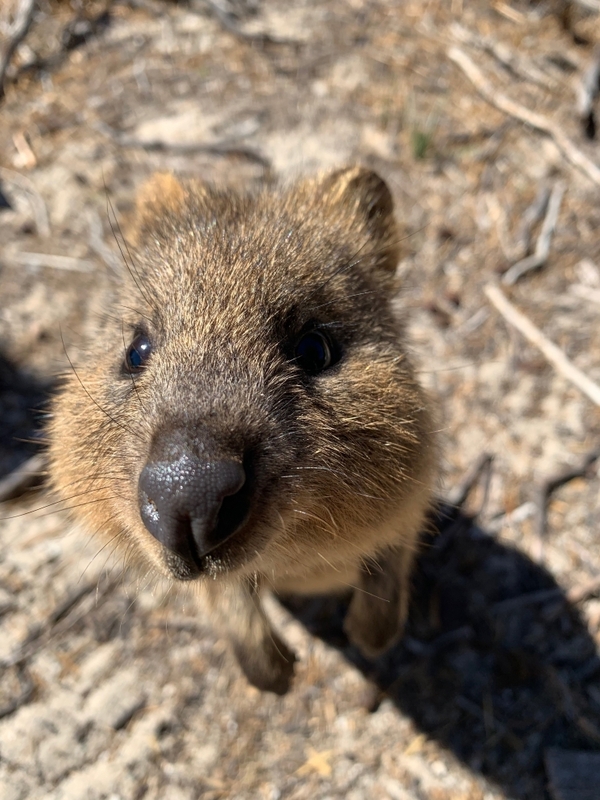 Of course Rottnest Island is famed for the extremely cute marsupial – the Quokka. During our visit to the island, we had several encounters with these adorable, quiet, unassuming little marsupials. Here is my quokka “selfie”! They hop along in a similar way to rabbits and munch on vegetation. To put their size into perspective, Quokkas are about the size of a typical domestic cat in the UK. If you let them come to you, they are very inquisitive – as you can see from this little chap who wanted to get a closer look at my phone! You are asked not to touch the quokkas to avoid the spread of disease/infections within their population. As a result, I can’t tell you what they felt like but those that ventured to check us out were very sweet. 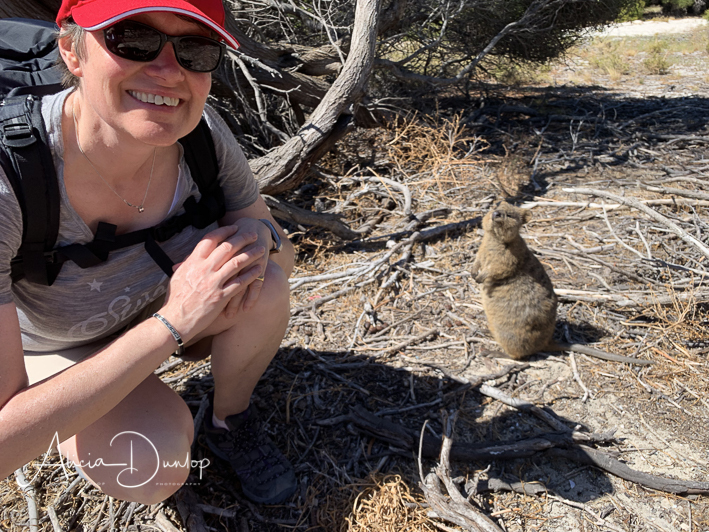 On the day we visited the island, as the sun shone brightly and temperatures were in the 30’sºC, we enjoyed a 6 mile walk around the salt lakes with a number of wildlife encounters. The walk starts at the main Rottnest settlement of Thompson Bay which has a small selection of shops and places to eat. We wandered on through Gordie, a smaller settlement, before looping through the salt lakes. It was interesting walking past the old heritage cottages that have now been turned into holiday accommodation and seeing one of the old lighthouses. It gave a small insight to how the first western settlers would have lived here back in the day. Do be aware that there are venomous snakes on Rottnest island. If you don’t bother them, they won’t bother you. We heard what we believed were snakes scurrying away from the path we were walking on, but other than the tip of a vanishing black tail, saw nothing more. Just the way I like it! 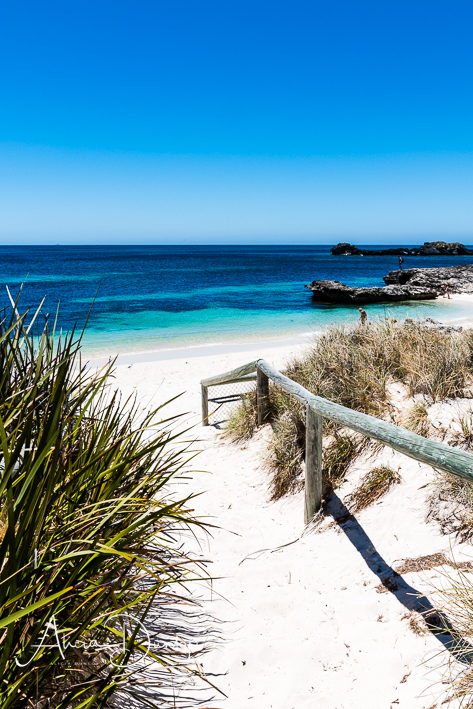 You can book the ferry to Rottnest Island from either Perth or Fremantle. We selected the newest route provided by Sealink. I really can’t fault the service they provided. The crew were polite, friendly and smiley. I’d happily use them again. I like the fact that they have broken the monopoly on visiting the island which has helped reduce the costs – so hopefully they will continue to grow and go from strength to strength. We picked up details of the walk from the information centre in Thompson Bay. The leaflet was free and provided us with a map we could follow easily. 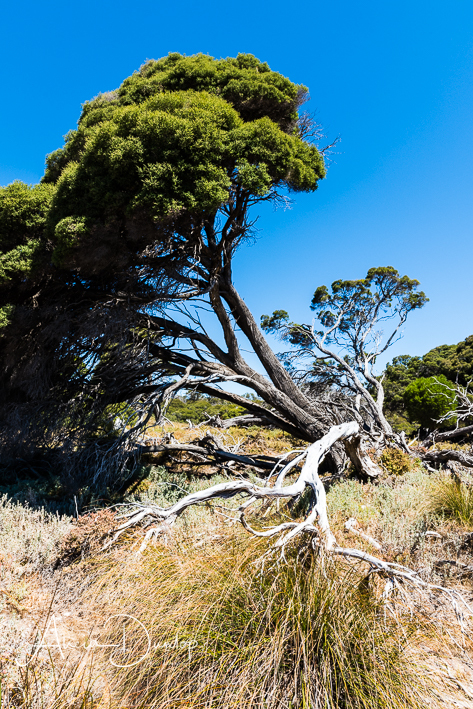 We really did have a wonderful day on Rottnest Island but don’t take my word for it, go see for yourself! Next time I tell you about our day visiting the Pinnacles Desert. Thanks for reading! Where will your next adventure take you? Warmest wishes, Alicia. Travel and Landscape Photography – Alicia Dunlop; Alicia Dunlop Photography.